A stall in Phó Cơ Điều Market, also known as Thiếc Market, located on Phó Cơ Điều Street in HCM City’s District 11 serves authentic Vietnamese gumbo or bún mắm, a signature dish from the southwestern region. 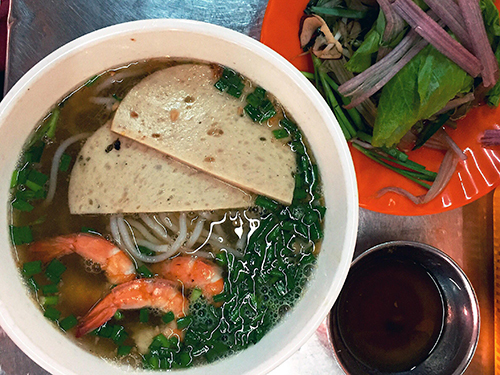 A disk of authentic Vietnamese gumbo or bún mắm. HCM CITY – A stall in Phó Cơ Điều Market, also known as Thiếc Market, located on Phó Cơ Điều Street in HCM City’s District 11 serves authentic Vietnamese gumbo or bún mắm, a signature dish from the southwestern region. Originally from Cambodia, the dish made with vermicelli, broth and fish sauce is simple but has a wonderful taste. The Cambodian dish is served with prahok dipping sauce, but in Việt Nam it is often replaced with fish sauce.